UMBC prepared me for a future in astronomy research by allowing me to get hands on experience with amazing mentors… I was also able to cultivate a passion for science education outreach which I hope to develop further in my graduate school endeavors. Natalie DeNigris has combined her interests in astronomy and education throughout her time at UMBC. As a researcher with physicist Eileen Meyer, DeNigris has explored x-ray emissions from black hole jets, receiving an undergraduate research award to support her work. As a Sherman STEM Teaching Scholar Affiliate and a volunteer with the Shriver Center, she grew her passion for science outreach. 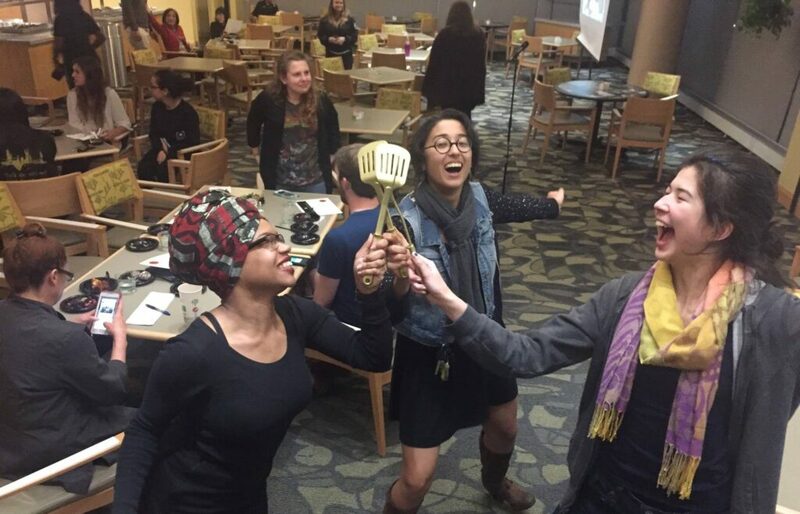 Enjoying time with friends, Natalie DeNigris (center) celebrates winning UMBC’s Iron Chef competition; photo courtesy of DeNigris. DeNigris has been honored as Learning Assistant of the Year in physics and received the Joseph F. Mulligan Award for physics. She was also named the Jacqueline Hrabowski Service Scholar for 2016 – 2017, a special recognition awarded to a student who demonstrates exceptional commitment to improving the lives of at-risk urban youth through academic support and community service activities. As she graduates from UMBC, DeNigris has weighed a job offer from NASA and multiple graduate school acceptances. She has decided to attend University of Massachusetts, Amherst for a Ph.D. in astronomy while also completing an internship at NASA Goddard Space Flight Center. She has a standing offer to return to NASA as an electrical engineer following her Ph.D.